“Old Christmas Day” or “Twelfth Day” or “Epiphany”. The name “Old Christmas” stems from a piece of legislation introduced before the Parliament in London, England called the Calendar Act of 1751 that came into effect in 1752. Before the calendar was reformed, England celebrated Christmas on January 6th. Essentially what happened in 1752 was that twelve days were dropped from the then existing calendar (Julian) calendar that was used in England and Ireland and the new Gregorian calendar (instituted by Pope Gregory XIII), was adopted. In 1752 purists said that the “real” Christmas Day was not on December 25th, but January 6th, 365 days after the previous Christmas. In centuries past, Christmas was deemed to start at sunset on Dec 24 and so the 12th night following it was January 5. Nowadays, people count from Dec 25 and so assume Twelfth Night falls on the 6th. 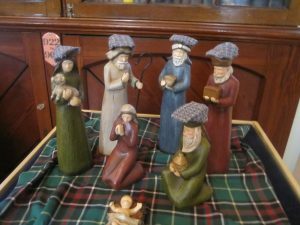 Epiphany – January 6 – is the day when the Church, theologically, marks the arrival of the wise men – magi – to give their gifts to the baby Jesus: the day when some will add the wise men to their nativity scenes. In Newfoundland it was a night to listen and watch. It is said that at the exact stroke of midnight on Old Christmas Eve, the farm animals, some kneeling will start moo-ing and baa-ing and bellowing… not in their normal way, but almost like they were crying. In Newfoundland many children struggled to stay awake to witness the phenomena. (Sadly they would fall asleep only to hear stories from their parents.) 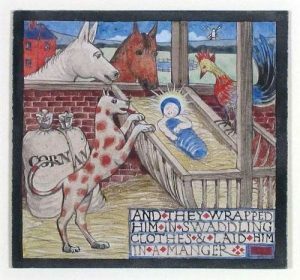 This belief harkens back to the stable in Bethlehem, and to the animals that were present when the Christ Child was revealed to the wise men . It is said that the cake was baked as part of the refreshments offered to the clergy who would visit homes on the feast of the Epiphany, January 6th, to bless each house in the parish. A tradition that had remained dormant in Newfoundland is the Irish tradition of “Nollaig na mBan” or “Women’s Christmas” this was an old custom that’s still celebrated by women all over Ireland. It goes back to the days when large families were the norm. Men never lifted a finger in the house to help, and were never expected to. But each year, after the Christmas holiday, tired women finally got a break – for one day, at least. On January 6th, men would take over of the housework, offering women a chance to go out to relax with each other. It was a tradition that is deeply rooted especially in Kerry and Cork, home to many of our ancestors. 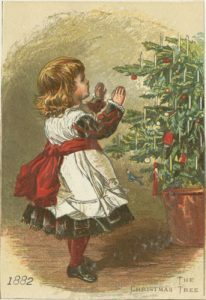 Several informants suggested that the tradition was also observed especially in Western Newfoundland, when the women gathered on Twelfth Night – Old Christmas Day. Many “new” Irish now living in Newfoundland have also revived the tradition by gathering on Old Christmas. This entry was posted in Archival Moments and tagged bonfire night, Christmas, Epiphany, Old Christmas, tree, Twelfth on January 6, 2019 by Larry Dohey. This entry was posted in Archival Moments and tagged bonfire night, Christmas, Epiphany, Old Christmas, tree, Twelfth on January 5, 2018 by Larry Dohey.